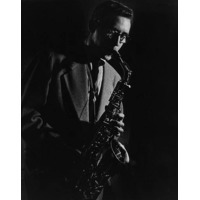 Lee Konitz (born October 13, 1927) is an American jazz composer and alto saxophonist born in Chicago, Illinois. Generally considered one of the driving forces of Cool Jazz, Konitz has also performed successfully in bebop and avant-garde settings. Konitz was one of the few altoists to retain a distinctive sound in the 40s, when Charlie Parker exercised a tremendous influence on other players. Konitz, like other students of pianist and theoretician Lennie Tristano, was noted for improvising long, melodic lines with the rhythmic interest coming from odd accents, or odd note groupings suggestive of the imposition of one time signature over another. Paul Desmond and, especially, Art Pepper were strongly influenced by Konitz. Konitz's association with the Cool Jazz movement of the 1940s and 50s, includes participation in Miles Davis' epochal Birth of the Cool sessions, and his work with Lennie Tristano came from the same period. During his long career, Konitz has played with musicians from a wide variety of jazz styles.